Ratings analysis and comparisons follow the charts. ABC: FRESH OFF THE BOAT and SPEECHLESS both took big hits in their moves to Friday. FRESH OFF THE BOAT fell 0.7 from its 2017 premiere (on a Tuesday) to 0.6, which was also down 0.4 from its Spring 2018 fianle. 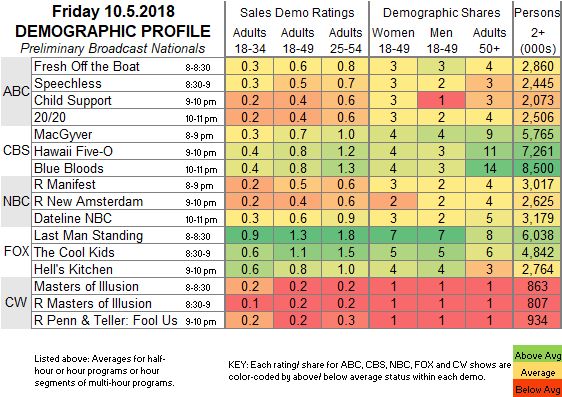 SPEECHLESS dropped 0.9 from 2017 (on a Wednesday) to 0.5, also down 0.8 from last season’s finale. CHILD SUPPORT returned at a dim 0.4, down 0.5 from its premiere last January. 20/20 fell 0.3 from last week to 0.4. FOX: LAST MAN STANDING dropped half a point from last week’s premiere, but at 1.3 it was once again easily the top show of the night. THE COOL KIDS lost 0.4 to 1.1. HELL’S KITCHEN slipped 0.1 to 0.8. CBS: MACGYVER held at 0.7, and both HAWAII 5-0 (0.8) and BLUE BLOODS (0.8) were down 0.1. NBC: After reruns at 0.5/0.4, DATELINE lost 0.1 to 0.6. CW: The season finale of MASTERS OF ILLUSION gained 0.1 to 0.2, followed by a rerun and a PENN & TELLER: FOOL US rerun at 0.2/0.2. HBO airs a FLIGHT OF THE CONCHORDS special tonight, and SATURDAY NIGHT LIVE is hosted by Awkwafina, with musical guest Travis Scott. On Sunday, there are premieres for AMC’s THE WALKING DEAD, ABC’s DANCING WITH THE STARS JR and SHARK TANK, and CBS’s MADAM SECRETARY. In addition, HBO’s BALLERS reaches its season finale.